With a time of 2 hours, 15 minutes, 14 seconds, Kenya’s Kipkoech Ruto (right, James Wallace photo), 23, won the 35th edition of the Anthem Richmond Marathon, taking home $3,000 in prize money – $2,500 for the first place finish and an additional bonus of $500 for finishing under two hours and twenty minutes. Aziza Aliyu, a 27-year-old Ethiopian, was the first female to cross the finish line, clocking in at 2:40:21. In the fifth year of the American Family Fitness Half Marathon, a new course record was set in the men’s division. 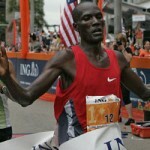 Thirty-five-year-old Mengstu Nebsi of Ethiopia crossed the finish line with a time of 1:03:21, besting the previous course record set by George Towett in 2010 by 23 seconds. In the HCA Virginia 8K, Raleigh, NC’s Ryan Hill (22:37) inched past Jacob Riley of Rochester Hills, Michigan (22:38). On the female side, 22-year-old Neely Spence captured first place with a time of 25:22, setting a new course record for the women’s 8K. A record 18,702 participants hit the streets of Richmond, taking part in the weekend’s events. The 26.2-mile Anthem Richmond Marathon drew 6,003 runners, a new registration record. One reason for the surge in numbers was the addition of more than 800 runners that opted to run the Richmond Marathon after the ING New York City Marathon was cancelled. The American Family Fitness Half Marathon had a sold out field of 8,215 and the HCA Virginia 8K had 4,484 participants. “It was awesome,” said Shannon Miller, a 34-year-old from Washington, D.C. who was the fifth female to cross the finish line in the HCA Virginia 8K. “I give it two thumbs up!” Miller was scheduled to run the ING New York City Marathon and decided to come to Richmond when the event in New York was cancelled due to Hurricane Sandy. In addition to a record-breaking number of participants, tens of thousands of spectators lined the streets leading to the spectacular new riverfront finish. 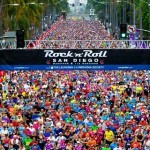 There were 28 bands and musical performers lining the courses as well as nine official cheering stations and four Party Zones. 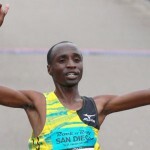 The top three local runners, male and female, were also awarded prize money in the 2nd Richmond Region Marathon Championship. This year Jon Molz was the first male Richmonder to cross the finish line with a time of 2:24:43 and Meredith Axisa was the first female (2:57.38). The first-ever Call Federal Credit Union Marathon Junior, a kids only running event tied to the Anthem Richmond Marathon, was held on Saturday, October 27. A total of 864 children ages 4-14 participated in the event at Byrd Park. 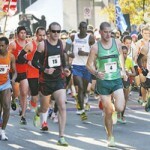 The 2013 Anthem Richmond Marathon is scheduled for Saturday, November 16. A special $65 marathon entry fee and $55 half marathon entry fee is available through 11:59 p.m. on Thursday, November 15.